See also my introductory BeeLine article. BeeLine lives. There has been made some nice development progress. You could almost assume somebody from the team read my first article because nearly everything mentioned in the improvement section has been realized. Another positive aspect is communication. The team reacts very fast on interactions on Twitter and via e-mail. It's quite exhilaranting to experience that there are real people working behind a product/brand...(yes, I'm looking at you, Google). Scrolling through route waypoints is accomplished by pressing the N/S buttons. If you reach the last waypoint you can end your ride by confirming the "Arrived?" question. There still is no information on waypoint progress on the device but it is shown in the app. If "Automatic Waypoint" is activated in the settings the next waypoint will be selected when passing the current one less than 100 meters. If you keep a distance larger than that Beeline will not change the selected waypoint even if another waypoint is closer. When choosing automatic waypoint routing there always remains the option to manually skip waypoints. I regard this to be a real killer feature which makes routing simple and precise while remaining discreet and in no way annoying. It did not happen anymore that I accidentally finished a ride, so this problem vanished. 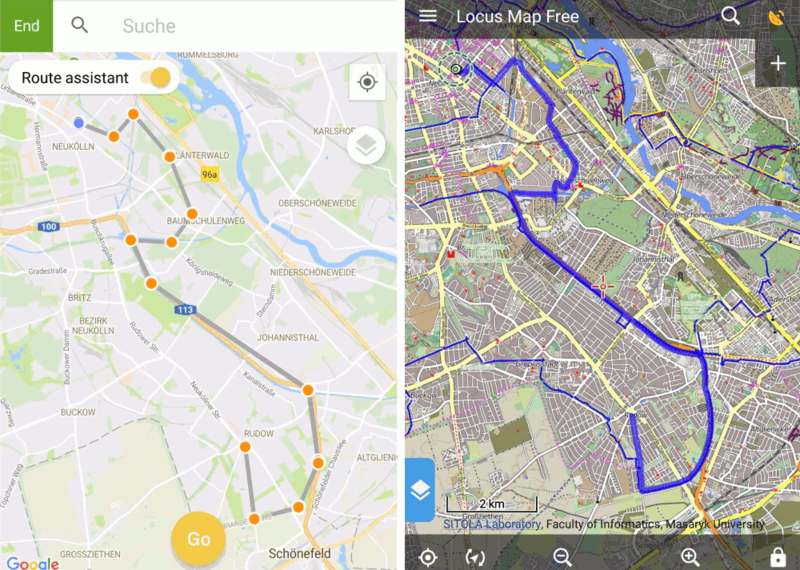 Not only can a route be created via BeeLine app but also be imported from a GPX file. In doing so the track will be simplified and (significant) changes of direction will be converted into waypoints. Two waypoints are always connected by a straight line (beeline). As you can see this works pretty nice. This route conversion provides waypoints for relevant route details (important changes of direction, crossroads, bridges) without determining a certain track layout. This would save some work for creating routes in reverse order. 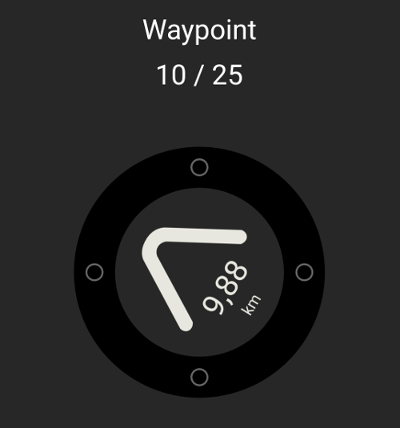 I'd like to have that waypoint progress status shown on the device like it is displayed in the app ("Waypoint 6/20"). Yes, I know that this is unrelated to distances. That information does not have to be permanently present, I can imagine it to be integrated as a page on the right/left button page scroll function. 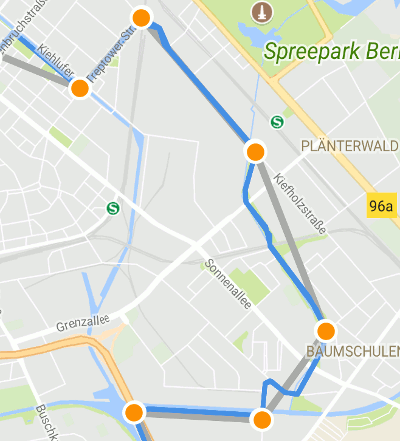 A funtion to pause/continue routes instead of finishing them would be helpful (for example to proceed on long tours or when spontaneously jumping into a nearby supermarket). We all hate it: the horseshoe symbol on the Beeline - bar left, bar right, front wheel up and agein. This is easy with the racing bike but a torture with the pannier packed trucker. I don't really have a constructive suggestion here. The calibration horseshoe often appears during a ride and disappears after a while (sometimes within seconds). I mostly ignore it now. I often ride the same routes. So why not show a route summary with some information (frequency, duration, distance, speed)? BeeLine has developed great and I will use it more frequently now. By expanding route functionalities (create, import, save, automatic routing) the device has become a really interesting and useful tool rather than just being a gadget. Of course BeeLine still depends on a smartphone connection providing location service and Bluetooth. It cannot replace a standalone navigation system. Therefore battery consumption of the phone has to be considered on long tours. Power banks exist.